There aren’t many jobs that require more bravery than being a firefighter. You risk your life to try to save those in danger, battling a blaze that could take the floor from under you or burst unexpectedly through a wall. 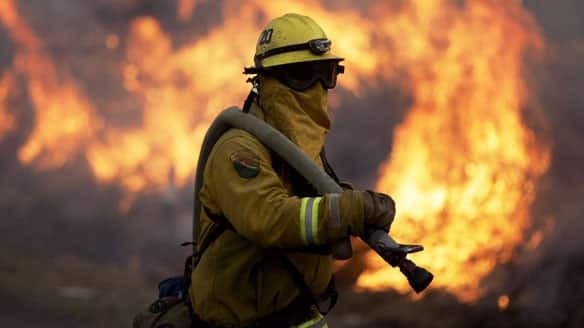 When your job is fighting wildfires, when wind conditions can shift suddenly and fires can leap quickly from tree to tree, the risks are even greater. So it was yesterday in Arizona, when 19 firefighters — 19! — were killed while trying to contain a huge wildfire in Yarnell, Arizona. It’s the largest loss of firefighters in a single day since 9/11. The firefighters were part of an experienced, elite unit that was attempting to clear brush to prevent the spread of the fire. The members of the unit were equipped with the latest technology, including special fire retardant blankets that are designed to allow firefighters to dig a hole, crouch in, cover themselves with the blanket, and hope that the fire burns over the top of the blanket without harming them. Yesterday, though, something happened. The fire turned, caught the firefighters in the wrong position, and the result was disaster. Some of the dead firefighters were found beneath their fire blankets, but the heat and flames were too intense for the technology. It must have been a terrifying and horrible way to go. Two members of the unit somehow survived and are being treated for severe burns. The Yarnell fire was started by lightning, during a period of intense heat in the desert southwest. It’s a natural occurrence that probably has been happening for thousands of years. The difference is that now people are building houses in those arid hills, and when fires start they expect firefighters to try to stop the fires and save their homes. Every summer, we read about wildfires threatening communities in California, Arizona, Nevada, and other states in the western U.S. When a tragedy like this occurs, and so many people die, I wonder: why are we allowing people to build houses in places that are regularly exposed to wildfires, and why are we asking courageous firefighters, and their families, to run deadly risks as a result? Wouldn’t it be prudent to reexamine our western land use policies, rather than regularly mourning the loss of some of our bravest citizens who died trying to protect homes that should not have been built in the first place? When I read the political news, I often feel like I’m in high school again. That was my reaction when I read the story this week about an apparently testy exchange between President Obama and Arizona Governor Jan Brewer on an airport tarmac. President Obama, fresh from his State of the Union speech, flew to Arizona to talk about his policy proposals. Brewer met him at the airport tarmac, and the two had a terse discussion. The President’s press secretary says the President told Brewer her version of a 2010 Oval Office meeting they had, described in a book Brewer recently wrote, was inaccurate. Brewer says she went to meet the President to talk about “Arizona’s comeback” and instead he focused on the book and seemed “thin-skinned” and “a little tense.” The President says the little snit was “no big deal.” No kidding! I find this kind of story embarrassing, because it exposes the unflattering qualities of our political leaders. With all of the problems besetting America and Arizona, why would the President need to bring up the characterization of a meeting that happened two years ago in a book that almost no one has even heard of, much less read? Isn’t he big enough to shrug off such things? If not, how much time is he spending fretting about other minor stuff? As for Governor Brewer, can’t she give the President a break and simply report that they had an animated discussion without calling him “thin-skinned”? Couldn’t she be a big enough person to resist the temptation to score cheap political points from this silly, meaningless incident? Next thing you know, we’ll learn that the President and the Governor were passing notes in study hall. Here’s a curious story: the United States State Department has cited the federal government’s lawsuit against the Arizona immigration law in a “required report” to the United Nations Human Rights Council as one of the 100 steps the federal government has taken to uphold human and civil rights in the United States. Arizona’s governor, Jan Brewer, has reacted to this news with studied outrage. There are lots of weird facets to this news item. For example, why is the United States “required” to file a report about its internal affairs with the United Nations Human Rights Council? (If we didn’t file the report, would the Council “flunk” us?) Why should we be reporting to a Council that includes such noted freedom-loving countries as Cuba, Libya, China, and Saudi Arabia (among other countries where citizens enjoy fewer freedoms than are found in the U.S.A.)? Moreover, do we really think that bringing a lawsuit that sought to enjoin the Arizona law before its enforcement was even attempted by police officers was really an important step in upholding human and civil rights? The clear impression is that the State Department is pandering to an international community that is desperate to conclude that the United States is filled with angry xenophobes whose hate-filled bigotry is only barely being held in check through legal steps taken by our federal government. The reaction of the Arizona Governor reported in the story linked above seems overdone, but it does rankle to think that our own national government is suggesting that one of our states needs to be restrained from violating human rights — and then is broadcasting that suggestion to repressive governments who don’t afford their citizens even the most basic freedoms provided by our Bill of Rights. The recent enactment (and even more recent amendment) of a state law in Arizona that criminalizes illegal immigrant status has brought the issue of immigration to the forefront of national attention. For the news reports I have heard, it seems to be one of those issues where people quickly choose up sides, adopt hard-line positions, and then are unwilling to try to understand the views and motivations of the other side. Massive marches to protest the Arizona law are planned for today. Yesterday four of us from the office — JV, The Unkempt Guy, the Domer, and me — had an animated but respectful, and I think helpful, discussion about the immigration issue. Although we approached the issue from different perspectives, our discussion indicated that there are some clear points of agreement. First, we all recognized (obviously) that racial profiling is unacceptable and destructive of our free and pluralistic society. The biggest challenge for the Arizona statute, if it ever takes effect, will be to develop some method for determining “reasonable suspicion” that is not, in reality, focused exclusively or primarily on skin color and language capabilities. Perhaps everyone who is stopped by police should be treated equally and asked to provide the same evidence of citizenship or legal immigrant status, as a routine matter. Second, we all agreed that maintaining secure borders is a fundamental requirement of nationhood and the job of the federal government. If you cannot prevent marauding bands of armed men from crossing the border at will, can you even call yourself a country? It may be easy for people in Ohio or other northern states to criticize the citizens of Arizona or downplay their concerns, but I’ve heard some harrowing reports about Americans who live near the border who have been hurt, killed, or terrorized by the armed groups of drug runners or human traffickers who have crossed the border and roamed the desert with impunity. Who would want to be awakened at night by the sounds of unknown groups of men crossing their property? Third, we all agreed that legal immigration has been a wonderful thing for our country and should be encouraged. This should not be a surprise — all of us have ancestors who came to this land, though Ellis Island and other ports of entry, from various parts of Europe and the British Isles, eager to start a new life in a New World of freedom and opportunity.